‘Gardens in the Sky’ in Kensington is the affectionate name by which many know the Warwick Road Estate situated on either side of Pembroke Road. 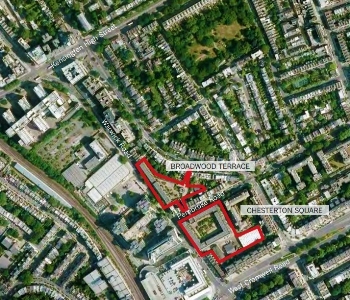 It is a ‘mixed use’ estate with two main blocks; Broadwood Terrace to the north and Chesterton Square to the south. 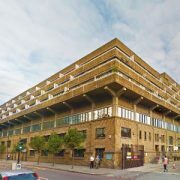 The future of the site is currently being debated by the Royal Borough of Kensington and Chelsea and here we discuss the history of the site and development plans. Both Gardens in the sky blocks are raised and the ground floor is used as parking and maintenance workshops for RBKC Council’s refuse collection vehicles. These are all tall spaces which need natural ventilation, hence the large blank facades at street level, punctuated by patterning in the brickwork to facilitate gaps to supply this. Above these and underneath Chesterton Square are offices, some of which are used by the Council, and underneath Broadwood Terrace there are car parking decks. On both sides this is topped with the ‘gardens in the sky’ and flats for the residents, both tenants and leaseholders. 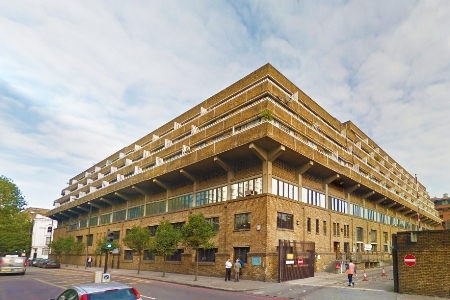 The sites have been used by RBKC Council since the early part of the last century and the current blocks, designed by Ove Arup where built in the 1970s. About four years ago RBKC commissioned a study by Lambert Smith Hampton, supported by the architects Skidmore, Owens and Merrell to review how the site was used. Those proposals were published in 2014 and led to an outcry from both residents and amenity societies including ESSA. An attempt was made to get the buildings listed but did not succeed. Although Historic England did not consider that the buildings had sufficient merit to justify listing, they did acknowledge the quality of the brickwork. After 2014 the Council appointed new consultants, CBRE, to assist them in preparing a brief and selecting the necessary architects to develop the designs to a stage at which they could decide on the way forward. The first part of that process has now been completed with the selection of the architects and their introduction to residents and people with local interests on 5th July. ESSA was invited to attend the selection process as observers and we were able to provide comments on the individual presentations. The intention at this stage was not to select a scheme but appoint an architect with a sympathetic approach to the development and each of the presentations covered interesting aspects of the site potential. The depot facilities are to be reduced with some of the maintenance duties to be transferred to another site, which would free the Gardens in the sky sites for an alternative use. The Council has clearly learnt from the response to the previous study and the next stages will involve in-depth consultations with residents and other parties, including those living close by, and local amenity societies. There will be two full consultation sessions with proposals being developed for presentation to the full Council in the early part of 2017. All options are on the table including the possibility of taking no action. Now is the opportunity for all those affected to have their say. If you want to be kept up to date you can register to be notified of updates under ‘Contact Us’ at www.rbkc.gov.uk/pembrokeroad. Alternatively, keep in contact with ESSA as we plan to be fully involved in the development of this important site, which the Council aspires to preserve as part of conservation for the future and, on a more routine level, to accommodate equipment for the high standards of street cleaning in the Borough. Let us ensure that the inspiration of the ‘Gardens in the Sky’ continues into the future, and includes potential for improvement within the public realm and the provision of more and better housing of all types. The Demise of the Kensington Odeon?